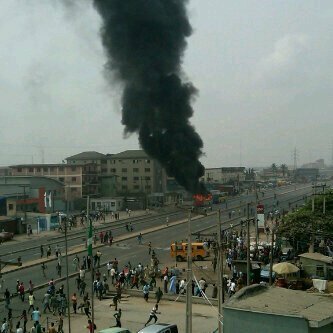 It happened this morning @ about 10:30 am around the Mile 12 area of Lagos State. An okada rider was crushed to death by a BRT (Bus Rapid Transport) while trying to escape from being arrested by the Lagos State Transport Management Authority, (LASTMA) officials who had been pursuing him from Ojota towards mile 12 for violating a traffic law. After discovering that the Okada rider had died in the pursuit, the LASTMA officers took to their heels and ran towards Ketu for safety. 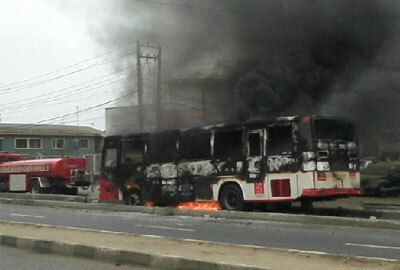 Okada riders and and angry youths who witnessed the incident set an empty LAGBUS and a BRT ablaze. Yeah, things like this happen in Lagos. May the Okada man RIP. Did you mean take to their heels? thanks for the corrections my dears. why on earth do people have to destroy infrastructures that was provided to make life easy for them? whats the sense in that? i love gidi mehn...jungle justice!!! The story of Acid Victim, Comfort Sunday.